One day my younger brother Douglas and I headed to our local comic book store. Douglas has been interested in reading comics again so I suggested he start reading the New 52. Since I already buy Justice League and Justice League International, he decided to get Batman and Superman so we could swap comics. I was really excited to hear his opinions on the new Batman and just as excited to get my hands on his comics. I took his comic and skimmed over the pages to see what he was talking about. I found it clear as day on page 17 of Batman #1. I read the little info squares above each character and started thinking. Doug’s argument was that each of the three characters had so much history to them. How was it possible that they were all standing there looking like a family and on the same team? Basically, you won’t miss what you don’t realize is different. After I explained this to him, I saw the wheels in his head turning and then finally click into place. In regards to Batman, I think this was done by DC to show they were really serious about starting over. 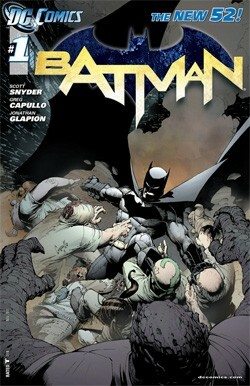 You see not only Batman’s history being re-written, but also those around and involved with him. After I finally had his comics to myself, I sat down and started with Batman. Something strange happened while I was reading. I started to feel things I hadn’t expected. Having never read a Batman comic book before, I noticed that there was a certain darkness about it. I had some excitement in me, but I also felt despair and worried for the world I was reading about. This isn’t something I get when reading other comic books. For example, in the Justice League, the colors, humor and attitude of the characters makes me feel hopeful and ready to cheer them on. Feeling emotionally drained after reading a comic book was something new for me. My husband managed to get his mitts on the Superman comics before me. When he was finally done, he said his only problem with the Superman comics was he felt like he should be reading Action Comics alongside next to it. He saw in some scenes when a flashback was going on, that Superman would be drawn just like he looks now in Action Comics. Other than that he said he was really enjoying the storyline and was excited to see the next ones. Reading Superman taught me something about my marriage: my husband and I have very different views on what we consider to be a “problem” in a comic. 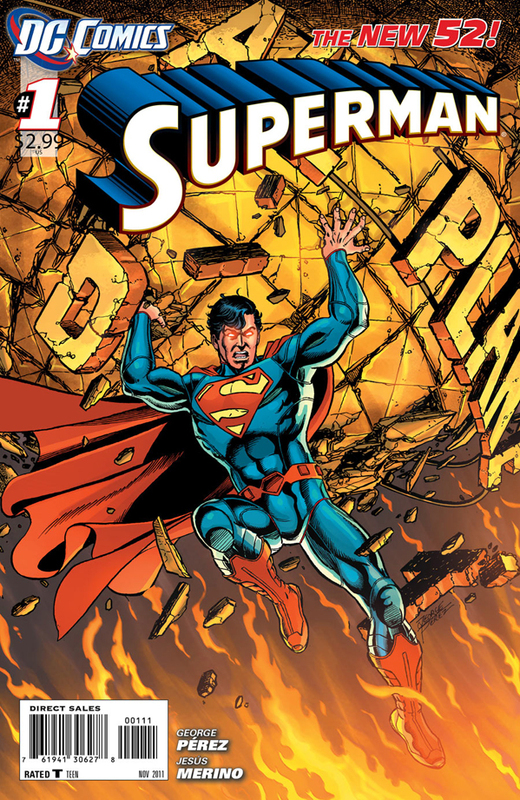 After I read the first two Superman issues, I already saw some major changes, non of which seemed important to my husband. The biggest change for me was Lois Lane shifting jobs and sitting behind and executive’s desk. One of the things I loved in the animated series was watching Lois as a field reporter. It will be interesting to see how she fares behind the desk and what kind of “danger” she can run into now. On the upside, this opens up the character for a new world of problems both personally with Clark and professionally with her new boss. Overall, I enjoyed reading the fresh start both Superman and Batman were given in the New 52. Even though I won’t be rushing to the store for every new issue, I’m happy to see the excitement in other comic book readers. Veteran comic book readers will notice the changes in both immediately. While some might say this takes away the legacy of the characters, I have to disagree. I think the New 52 is not treading on their legacy, it’s making it richer. Gotta check out the new Batman. It was always intimidating to start reading a comic with so much history. Thanks!